Central location of the Susquehanna in Pennsylvania during the Beaver Wars with tribes shown about 1648-1650. Susquehannock people, also called the Conestoga by the English,  were Iroquoian-speaking Native Americans who lived in areas adjacent to the Susquehanna River and its tributaries ranging from its upper reaches in the southern part of what is now New York (near the lands of the Five Nations of the Iroquois Confederacy), through eastern and central Pennsylvania West of the Poconos and the upper Delaware River (and the Delaware nations), with lands extending beyond the mouth of the Susquehanna in Maryland along the west bank of the Potomac  at the north end of the Chesapeake Bay. Evidence of their habitation has also been found in northern West Virginia and portions of southwestern Pennsylvania, which could be reached via the gaps of the Allegheny or several counties to the south, via the Cumberland Narrows pass which held the Nemacolin Trail. Both passes abutted their range and could be reached through connecting valleys from the West Branch Susquehanna and their large settlement at Conestoga, Pennsylvania. Depiction of a Susquehannock on the Smith Map (1624). The handwritten caption reads (in modern English): "The Susquehannocks are a giant-like people and thus attired." The Europeans adapted or transliterated these names according to their own languages and spelling systems, trying to capture the sounds of the names. The Powhatan-speaking peoples of coastal Virginia (also Algonquian) called the tribe the Sasquesahanough. The English of Maryland and Virginia transliterated the Powhatan term, referring to the people as the Susquehannock. Map of New Netherland & New Sweden, whose Europeans were most in contact with the Susquehannock Peoples before their sudden fall from power ca. 1670-1672. The British experiences in the Baltimore were mostly negative, as the colony fought a war with the tribe. The original population of the Susquehannock is uncertain due to lack of contact with the Europeans, whose records provide such data. The Europeans' best guesses are that the tribe numbered from 5000-7000 in 1600, and that the Susquehannock were a regional power capable of holding off the Iroquois Confederacy  in the first seven decades of the 17th century, including after the Iroquois began systematic warfare against neighboring ethnic groups in pursuit of acquiring firearms during fur trading. Before that time, it was the inland Susquehannock who had allied themselves to Dutch and Swedish traders (1600 & 1610) and Swedish settlers in New Sweden around-1640 who had a monopoly on European flintlock firearms, increasing the tribe's power. These firearms were carefully not traded to Iroquois or Delaware  until the defeats of the Dutch  imposed British traders, who initially favored the Iroquois,  into the North American Amerindian tribal rivalries and also kept firearms away from the more coastally located Delaware peoples. The Susquehannock, who were all but extinct by the time the British asserted any significant local control, had early on allied with the Swedes, who traded them firearms for furs as early as the 1610s but now found themselves generally often at odds with the new European managers of Maryland and Pennsylvania. Consequently, the nation also fought a war declared by the Province of Maryland  from 1642-50s and won it, albeit with help from their long-time allies the Swedes. 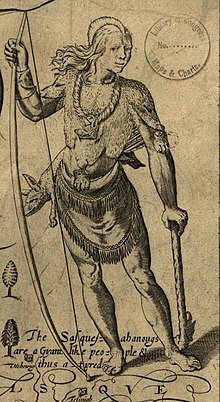 But following the zenith of their tribal power in the early 1670s,  the Susquehannock suffered an extremely rapid decline mid-decade in population and power,  - presumably from infectious diseases such as smallpox, which also decimated other Native American groups such as the Mohawk and other Iroquois. Drastically weakened by their losses, they were overwhelmed within a couple of years by the balance of the Iroquois by 1678,  though some small groups are believed to have fled west via the gaps of the Allegheny into Western Pennsylvania or beyond into the Ohio Country, possibly becoming absorbed by the Shawnee. Their numbers in their Susquehanna Valley homeland may have diminished to as few as about 300 in 1700 with another remnant group well to the west in the Allegheny settlement the English called the Conestoga people near Conestoga, Pennsylvania. Before the American Revolution, in mis-targeted response to rumors that they were supporting Pontiac's War, the Native Americans living in Conestoga were massacred by the Paxton Boys. Susquehannock artifacts on display in the State Museum of Pennsylvania in Harrisburg. The Susquehannock society was a confederacy of up to 20 smaller tribes, who occupied scattered villages along the Susquehanna River. The Susquehannock nation remained independent and not part of any confederacy into the 1600s. Ultimately, they were not strong enough to withstand the competition from colonists and other tribes in their piece of the so-called Beaver Wars of that century. About 1677 their remaining people, decimated by disease and war, merged with their former enemies and distant language kin, the Haudenosaunee ( Iroquois) Five Nations, based in New York. Archeological materials have been found in Pennsylvania, and Maryland's Allegany County at the Barton (18AG3) and Llewellyn (18AG26) sites. West Virginia's Grant, Hampshire and Hardy counties region (Brashler 1987) also have archaeological sites where Susquehannock ceramics have been found. The English seldom visited the upper Susquehanna inland region during the early colonial period. It is likely that the Susquehannock had occupied the same lands for several hundred years. When Captain John Smith of Jamestown met them in 1608, they had a formidable village in the lower river valley (present-day Lancaster, Pennsylvania developed near here.) Captain Smith wrote of the Susquehannock, "They can make neere 600 able and mighty men, and are pallisadoed [palisaded] in their Townes to defend them from the Massawomekes, their mortall enimies." He was astonished to find the Susquehannock were brokering trade with French goods. He estimated the population of their village to be 2,000, although he never visited it. The French explorer Samuel Champlain noted the Susquehannock in his Voyages of Samuel Champlain; in 1615, he called one of their 20 villages, Carantouan. It was located on the upper Susquehanna River near present-day New York state. It rallied more than 800 warriors with two other villages, Champlain reported. Modern estimates of the total Susquehannock population, including the whole territory in 1600, range as high as 7,000 people. During the sixteenth century and carrying forward into the first decades of colonization, the Susquehannock were the most numerous people in the Susquehanna Valley. During the early Dutch colonization of New Netherland, the Susquehannock traded furs with the Europeans. As early as 1623, they struggled to go north past the Lenape (later known as the Delaware), who occupied territory along the Delaware River, to trade with the Dutch at New Amsterdam. In 1634, the Susquehannock defeated the Delaware in that area, who may have become their tributaries. In 1638, Swedish settlers established New Sweden in the Delaware Valley near the coast. Their location near the bay enabled them to interrupt the Susquehannock fur trade with the Dutch further north along the coast. In 1642, the English Province of Maryland declared war on the Susquehannock. With the help of the Swedes, the Susquehannock defeated the English in 1644. The Susquehannock were in an intermittent state of war with Maryland until 1652. As a result, they traded almost exclusively with New Sweden to the north. In 1652 the Susquehannock concluded a peace treaty with Maryland. In return for arms and safety on their southern flank, they ceded to Maryland large territories on both shores of the Chesapeake Bay. This decision was also related to the Beaver Wars of the late 1650s, in which the Haudenosaunee swept south and west against other tribes and territories to expand their hunting grounds for the fur trade. With the help of Maryland's arms, the Susquehannock fought off the Iroquois Confederacy for a time, and a brief peace followed. In 1658, the Susquehannock used their influence with the Esopus to end the Esopus Wars, because that conflict interfered with their important trade with the Dutch. From 1658 to 1662, the Susquehannock were at war with the powerful Iroquois confederacy based south of the Great Lakes, which was seeking new hunting grounds for the fur trade. By 1661, the Maryland colonists and the Susquehannock had expanded their peace treaty into a full alliance against the Iroquois. Fifty Englishmen were assigned to the Susquehannock to guard their fort. In 1663, the Susquehannock defeated a large Iroquois invasion force. In April 1663, the Susquehannock village on the upper Ohio River was attacked by Seneca, Cayuga, and Onondaga warriors of the western Iroquois. (JR: 48:7-79, NYCD 12:431). In 1669-70, John Lederer was guided by a Susquehanna man on his journey to southwest Virginia and North Carolina (Mooney 1894:32). Paul A. W. Wallace writes, "In 1669 Iroquois Indians warned the French that if they tried to descend the Ohio River they would be in danger from the "Andastes." (Susquesahanocks: Wallace 1961:13). In 1672, the Susquehannock defeated another Iroquois war party. The Iroquois appealed to the French for support because the Iroquois could not "defend themselves if the others came to attack them in their villages". Some old histories indicate that the Iroquois ultimately defeated the Susquehannock, but no record of a defeat has been found. In 1675 the Susquehannock suffered a major defeat by the Iroquois League. English colonists invited the tribe to resettle in Maryland, where they relocated across the river from Pennsylvania. But the Susquehannock suffered from getting caught up in Bacon's Rebellion the following year. After some Doeg Indians killed some Virginians, surviving colonists crossed into Maryland and killed Susquehannock in retaliation. The Susquehannock moved to old Fort Piscataway, below present-day Washington, DC. Problems on the frontiers led to the mobilization of the militias of Maryland and Virginia and, in confusion, they surrounded the peaceful Susquehannock village. When five Susquehannock chiefs came out to negotiate, they were murdered. The Susquehannock slipped out of the fort at night and harassed settlers in Virginia and Maryland, then eventually returned to the area of the Susquehanna River. Around 1677, most of the remaining Susquehannock moved to New York, joining mostly with the Seneca and Onondaga nations, who also spoke Iroquoian languages. The Iroquois, who had a longer tradition of adopting defeated enemies into their tribe,  and Governor Edmund Andros of the Province of New York told the Susquehannock they would be welcome in New York and protected from Maryland and Virginia. Some returned to their homeland on the southern shores of the Susquehanna River, keeping their distance from the center of Iroquois power. Others moved to the upper Delaware River into the somewhat depopulated Delaware Nation lands (ravaged both by the Susquehannock who had made them tributary and the Iroquois, which had competed with the Algonquian-speaking peoples), where they lived under the protection of New York. After adopting the majority of the Susquehannock, the Iroquois acquired a right to most of the territory along Susquehanna River, but they never claimed below the Fall Line. To the southwest, the remnant Susquehannock merged with the Meherrin, and allied Nottoway or Mangoac, the Iroquoian-speaking tribes of Virginia. The new group called themselves Chiroenhaka, according to the 20th-century ethnologist James Mooney. As of 2009, researchers have found archaeological evidence of Susquehannock movement into and habitation of areas such as the Mouth of the Seneca  and Pancake Island  villages in present-day West Virginia, according to Bryan Ward, West Virginia Division of Culture and History. The Susquehannock population had been devastated by high fatalities from new Eurasian infectious diseases, to which they had no immunity, followed by warfare. About 1697, a few hundred surviving Susquehannock settled in a new village in Lancaster County, Pennsylvania called Conestoga Town. The river was named for them as the Conestoga River under Governor William Penn. A type of wagon was named for them that was later used by pioneers migrating west. Hardware kits for them were made on the east side of the Alleghenies. Susquehannock High School of Southern York, Pennsylvania is named for the tribe. ^ a b c Marianne Mithun. 1981. "Stalking the Susquehannocks," International Journal of American Linguistics 47:1-26. ^ As cited in Schutt, 64. ^ Maymon, Jeffery H. and Thomas W. Davis (1998), "A Contact Period Susquehannock Site in the Upper Potomac River Drainage: Data Recovery at Site 46HY89, Moorefield, West Virginia", Abstract of paper presented at the 28th Annual Meeting of the Middle Atlantic Archaeological Conference, Cape May, New Jersey. ^ Brashler, J.G. 1987. "A Middle 16th Century Susquehannock Village in Hampshire County, West Virginia," West Virginia Archeologist 39(2): 1-30. ^ TYLER, LYON GARDINER. "NARRATIVES OF EARLY VIRGINIA 1606 — 1625". Internet Archive. BARNES & NOBLE, 1907. Retrieved 28 July 2015. ^ a b c d "Susquehannock State Park". Susquehannock State Park. Pennsylvania Department of Conservation and Natural Resources. Retrieved 2011-10-20. ^ Varga, Colin (Winter 2007). "Susquehannocks: Catholics in Seventeenth Century Pennsylvania". Pennsylvania Heritage Magazine. XXXIII (1): 6–15. Brinton, Daniel G. and the Rev. Albert S. Anthony. Lenâpé-English Dictionary. From an Anonymous MS. in the Archives of the Moravian Church at Bethlehem, PA. Philadelphia, PA: The Historical Society of PA, 1888. Illick, Joseph E. Colonial Pennsylvania: a History. New York: Scribner & Sons, 1976. Kent, Barry C. Susquehanna's Indians. Harrisburg: The Pennsylvania Historical and Museum Commission, 1984. Witthoft, John, Susquehannock miscellany, Pennsylvania Historical and Museum Commission, 1959. Guss, A.L., Early Indian history on the Susquehanna: Based on rare and original documents, L.S. Hart printer (Harvard reprint), 1883. Eshleman, H.F., Lancaster County Indians: Annals of the Susquehannocks and Other Indian Tribes of the Susquehanna Territory from about the Year 1500 to 1763, the Date of Their Extinction. An Exhaustive and Interesting Series of Historical Papers Descriptive of Lancaster County's Indians, Express Print Company (Princeton University reprint), 1909. Wallace, Paul A. W. Indians in Pennsylvania. 2nd ed. Harrisburg: The Pennsylvania Historical and Museum Commission, 2005.